A crown of stars adorns the top of iconic Mount Begbie. I have never seen such a sight but would love to! My family and I left Revelstoke, home of the majestic beauty of this mountain. The housing bubble has made living in this town impracticable. We moved an hour and a half away on the other side of Roger's Pass, to a quaint and underrated town called Golden. For the same rent, we get twice the house and it seems this town has lots of room to grow, unlike dear Revelstoke. 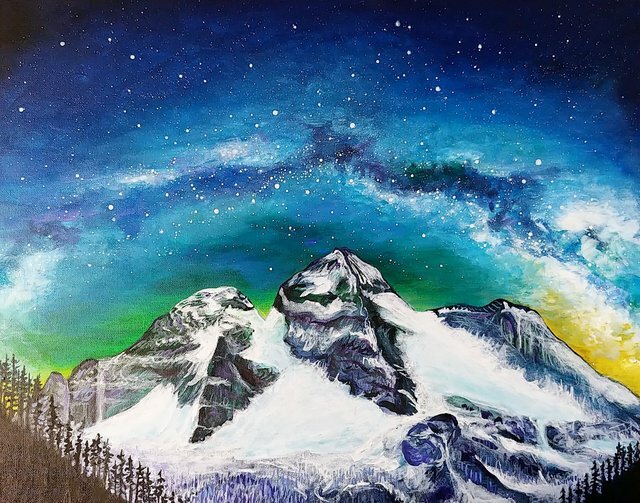 This painting has sold and we have moved on, but there will always be a special place in my heart for Revelstoke and my favorite mountain! Hello @michelleart! This is a friendly reminder that you have 3000 Partiko Points unclaimed in your Partiko account!